Founded in 25BC, Merida is located in the province of Badajoz, which is the largest province in Spain and borders with Portugal. Located along the Silver Route (or Via del Plata), a pilgrimage route to Santiago de Compostela during the Middle Ages, Merida has been declared a World Heritage Site because of its well preserved Roman archaeological sites. It was originally the capital of the Roman province of Lusitania, and the history of this Roman legacy is exhibited in the National Museum of Roman Art with a priceless collection of over 36,000 artefacts. The main attraction in Merida is the Roman Theatre and Amphitheatre. The Theatre stands on San Albin, a hill chosen because of its acoustics. It has seating for up to 3,000 people and the podium stands over 2.5m high. The Merida Amphitheatre was built in 8BC, and this was where the Gladiator contests were held fighting with wild animals. There is a cross-shaped moat in the centre and you can still see original elements such as the grandstands and gallery. The Amphitheatre House actually comprises of two houses, and is situated next to the Amphitheatre. The best preserved of these two houses was built in the peristyle which is rooms opening out into courtyards. There are thermal baths, frescos on the walls, and mosaic hallways with a particularly interesting mosaic in the dining room. Casa del Mitreo is an extraordinarily beautiful house that belonged to a very important Roman family. The rooms are decorated with murals and beautiful mosaics, with the most important one being the Cosmic mosaic representing Heaven, Earth and the Oceans. Chariot races took place in the Merida Circus and the arena and seating area are still visible today, which makes it one of the best preserved circuses in existence. There is also the Roman Temple to Diana which is probably one of the most majestic Roman sites in Merida, and where the Duke of Corbos built his16th century palace using the base of the structure. The Alcazaba Fortress is an imposing complex built near the river by the Arabs in the 9th century to prevent attacks from internal rebels as well as from outsiders. 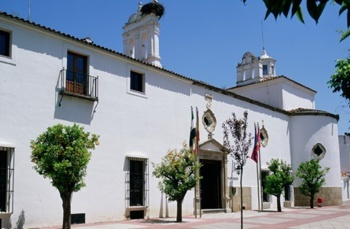 After King Alfonso IX gained control of the town it was donated to the Order of Santiago. In the parade ground stands the original Roman water cistern with a barrel vault roof. Five kilometres from town is the Prosperita Roman Reservoir, which supplies water to the Merida via a long water pipe and an aqueduct. The San Lazaro Aqueduct is just one of three, and was originally 1km long, however all that remains today is one small section. The Roman Bridge over the Albarregas River was built during the Augustus period, and stands parallel to the spectacular Milagros Aqueduct. Two of the arches are open to allow the spillway from the aquaduct. The Roman Bridge over the Guadiana River is one of the largest Roman bridges still in existence in Spain measuring 800m high with 60 arches. If you are looking for an exceptional hotel while you are visiting Merida, the Parador Merida (Hotel Via de La Plata) is an 18th century convent that has been converted into a luxury four star hotel. The convent was built over the site of the ancient ruin of a temple dedicated to Concordia de Augusto. It is filled with amazing artefacts dating back to the Romans, and the inner courtyard has beautiful Mozarabic gardens. There is also a seasonal swimming pool, sauna and gym. One of the best times to visit Merida is in July when they hold a very special Festival of Classical Greek and Roman Drama. September is when the town celebrates its annual fair and the year finishes with the Feast of Santa Eulalia Martir in December. There are also opportunities to go fishing, hunting, or even play a round of golf as the nearest golf club is only 3 miles away.